Blonde Ambition takes you by surprise! Christina's beauty and charisma makes it inevitable to see the "star" quality in this talented singer and Madonna Tribute Artist. A sound-alike with extensive international experience, she has enchanted audiences at sea and on land, from cruise ships to theaters, as well as TV appearances in The Unites States, Mexico, Belize, Bahamas and Cayman Islands. A one hour, full production show that includes two back up dancers (or more), and performances of Madonna's hits from 80s's to 2k. Wardrobe changes which include her 80's pop look, Madonna's iconic Jean Paul Gaultier's cone bra, and others. 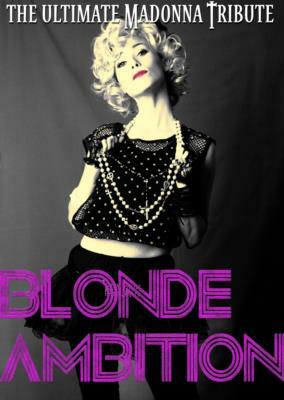 Bring the Queen of Pop to your next event with "Blonde Ambition"! Please note Blonde Ambition Madonna Tribute will also travel to Cathedral City, Rancho Mirage, Mountain Center, Thousand Palms, Palm Desert, Desert Hot Springs, Indian Wells, North Palm Springs, Ripley, Idyllwild, White Water, La Quinta, Indio, Cabazon, Anza, Morongo Valley, Hemet, Coachella, Aguanga, San Jacinto, Banning, Pioneertown, Salton City, Yucca Valley, Beaumont, Thermal, Joshua Tree, Forest Falls, Warner Springs, Nuevo.